This article is about the american football concept. For other uses, see Handoff (disambiguation). 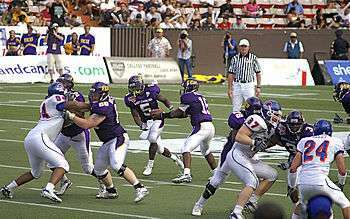 In American football, a hand-off is the act of handing the ball directly from one player to another, i. e. without it leaving the first player's hands. Most rushing plays on offense begin with a handoff from the quarterback to another running back. The biggest risk with any handoff is the chance of fumble on the exchange. A handoff can occur in any direction. Sometimes called a "switch" in touch football. Alternately spelled without the hyphen; i.e., "handoff". ↑ "The Quarterback's Stance, Drop Back, and Hand Off". dummies.com.